Wayne Grudem’s Un-Orthodox View of the Trinity and the Question that Must Be Asked: Can the ESV Bible be Trusted? Today’s post looks at the issue of how the Trinity has historically been tampered with by sects, and un-orthodox theology systems such as the Mormons. Today the trinity is being re-defined by the Neo-Calvinists, and looks at Wayne Grudem and his advocating of Eternal Subordination of the Son theology. It begs the question….should we trust the ESV Bible given that the person deeply involved in the translation has a view of the Trinity which goes against the Nicene Creed? There are different kinds of gifts, but the same Spirit distributes them. 5 There are different kinds of service, but the same Lord. 6 There are different kinds of working, but in all of them and in everyone it is the same God at work. In 1842 the founder and prophet of the Church of Jesus Christ of Latter-day Saints, better known as the Mormons sent a letter to the editor of the Chicago Democrat. 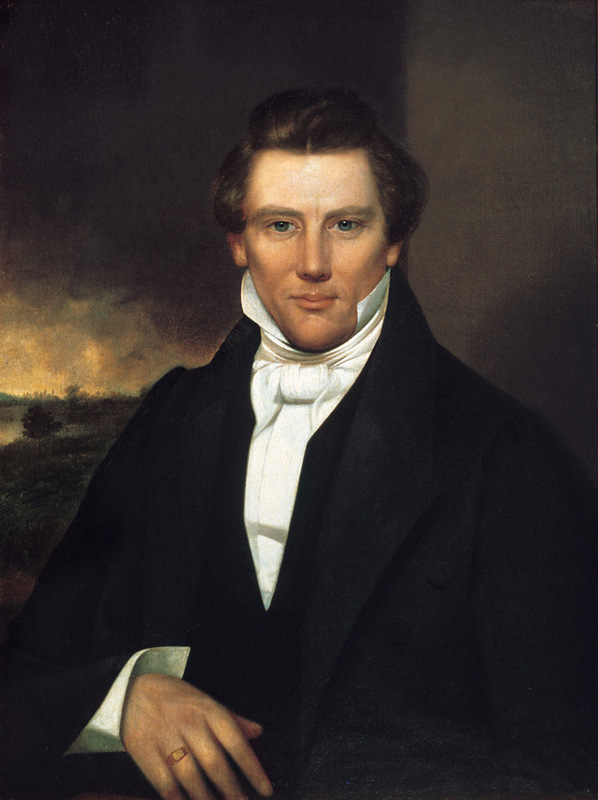 Joseph Smith’s letter to John Wentworth would be a summary of what the Latter Day Saints believe as a faith system and would become the Articles of Faith. John Wentworth was the main editor of one of Chicago’s newspapers, and he inquired as to what do the Mormons believe? Joseph Smith’s response helped outline and explain what the Mormon church believes on key doctrine. While it emphasized a lot of points I want to focus on one that is crucial. In Smith’s letter he said the following about the Trinity, which is in Article 1. The Church’s first Article of Faith is “We believe in God, the Eternal Father, and in His Son, Jesus Christ, and in the Holy Ghost.” This is a straightforward statement of belief that there are three members in the Godhead. However, Latter-day Saints do reject the doctrines of the Trinity as taught by most Christian churches today. For the most part, these creeds—the most famous of which is the Nicene Creed—were canonized in the fourth and fifth centuries A.D. following centuries of debate about the nature of the Godhead. Consequently, it is highly questionable whether these creeds reflect the thinking or beliefs of the New Testament church. “The exact theological definition of the doctrine of the Trinity,” notes J. R. Dummelow, “was the result of a long process of development, which was not complete until the fifth century, or maybe even later.” 1 As Bill Forrest remarks, “To insist that a belief in the Trinity is requisite to being Christian, is to acknowledge that for centuries after the New Testament was completed thousands of Jesus’ followers were in fact not really ‘Christian.’” 2 Certainly the revelatory manner by which Joseph Smith learned of the doctrine of the Godhead pierces through the centuries-old debate on the subject. This rejection of the Trinity has been pretty pronounced, with even Donny Osmond explaining on his website why the LDS Church rejects the Trinity. Meanwhile one of the most prominent Christian ministries in Utah which was run by Sandra and Jerald Tanner called Utah Lighthouse Ministry has written extensively on the Mormon view of the Trinity which you can read a sample here. I write about the Mormons and the Trinity for this one reason. The Trinity is critical to the Christian faith and its orthodox doctrine. Many cults, sects, and some parts of Christianity reject the Trinity or they have tampered with it to support their theology or beliefs. Oneness Pentecostalism also rejects the Trinity. Greg Boyd as I understand it has written about the issues of Oneness Pentecostalism. Wayne Grudem has been a key person in he Neo-Calvinist movement He also took money form C.J. Mahaney as well when he was finishing up the ESV Study Version I believe. Finally Wayne has three children. What is Eternal Subordination of the Son? John 3:16 (“God gave his only Son”) reinforces this view, Grudem said. “If one sends and the other is sent, then one commands and the other obeys,” said the Phoenix Seminary professor. “Yes, the Son represents the Father, but to be sent by the Father is also to be subject to the Father’s authority.” Grudem explained that the very terms for Father and Son would have implied authority and submission in the biblical world. Ware, currently a professor at Southern Baptist Theological Seminary, followed Grudem and marshaled quotes from Augustine, Anselm, Aquinas, and numerous other theologians to support their case. Tom McCall, a current TEDS systematic theology professor, teamed up with Keith Yandell, philosophy professor at the University of Wisconsin-Madison, to offer a different position. “There are no good reasons for orthodox Christians to hold to the position advocated by Drs. Ware and Grudem,” McCall began, ” and there are very good reasons for orthodox Christians to reject their account.” He explained that both sides uphold biblical authority, both sides employ philosophical categories for understanding the Bible, and both sides can quote Bible verses. The key is which side can interpret Scripture correctly. McCall took issue with a statement from Grudem’s book Evangelical Feminism and Biblical Truth in which he argues, “If the Father also submitted to the authority of the Son, it would destroy the Trinity, because there would be no Father, Son, and Holy Spirit, but only Person A, Person A, and Person A.” That view would be Sabellianism, also known as modalism — the heretical view that the one God appears to humans in three modes, not three distinct persons. Defending himself against possible charges of heresy, McCall said we may affirm that there are distinctions within the Godhead even if we don’t know what they are. In the past two weeks Carl Trueman and Dr. Liam Goligher have taken aim of Grudem’s teachings and even suggested that he is creating a new deity. There is a lot that has been written and I will let you read, and examine what is going on. This is the post that helped create athe most recent stir. Written by Dr. Liam Goligher, “Is it Okay to Teach a Complementarianism Based on Eternal Subordination?” looks at several problems with ESS doctrine in how its tied to complementarianism. Dr. Goligher looks at the danger that occurs when gender roles are extrapolated from the Trinity. Plus he also asks the question…is Wayne Grudem, Owen Strachen and other proponents of ESS creating a new deity? Are they crating a different God? Dee Parsons does a great job analyzing these issues in this post called “A Reformed Theologian and a Reformed Blogger Take on the Eternal Subordination of the Son as It Relates to Complementarianism.” In that post Dee Parsons looks at the claims and the strong push back by a reformed blogger Dr. Liam Goligher. On June 9, 2016 Wayne Grudem responded to the article about him by Dr. Liam Goligher. In this article he defends his view of the trinity and responds in a post called, “Whose Position on the Trinity is Really New?” Here is what Wayne Grudem says about him rejecting the Trinity. (1) Claiming that we deny what we affirm: One would think that when a writer claims that I deny the doctrine of the Trinity as defined in the Nicene Creed he might at least be expected to mention that in my Systematic Theology, which has been in print for 26 years, I emphatically and extensively affirm the doctrine of the Trinity as defined in the Nicene Creed, including the full deity of the Son, who is of the same nature (homoousios) as the Father (see pages 231-257 and 543-563). I believe “in one Lord Jesus Christ, the only-begotten Son of God, begotten of the Father before all worlds, God of God, Light of Light, very God of very God, begotten, not made, being of one substance with the Father; by whom all things were made.” (Nicene Creed, 325 AD, revised, 381 AD, in the Received Text of the Protestant churches). In addition, Bruce Ware and I and several others have continued to affirm the full deity of the Son in subsequent writings [see especially One God in Three Persons, edited by Bruce Ware and John Starke (Crossway, 2015)], but these authors fail to mention that. They are saying that we deny what we explicitly affirm, without mentioning that we affirm it. Also of note is Carl Truman’s article to Wayne Grudem which you can read here. Wayne Grudem despite his un-orthodox view of trinity became deeply involved in the creation of the ESV Study Bible. I remember when Andrew of Redeemer Arlington was trying to get me to read that work. Good God! I can’t believe the celebrity pastors who endorsed it as it was a major red flag for this strong skeptic at the time. I would suggest to you that the ESV is really a knee jerk reaction to the TNIV. Many Neo-Calvinist went ape over the TNIV version which had more gender neutral language. What is gender natural? Instead of calling someone a police man you call them a police officer. In 2002 the Council of Biblical Manhood and Womanhood issued a post in which they critiqued and stated what is wrong with TNIV. In May of 2002 over 100 individuals signed a statement stating that the TNIV is to be rejected and is not trustworthy. You can read that post here. In 2004 Ben Worthington wrote at his blog his concerns about the ESV as he was told by someone involved in the TNIV translation committee. That one scholar referred to in that post is Wayne Grudem. Also of interest is a critique of Wayne Grudam by his former student Kermit Titrud who rakes Grudem over the coals for his view of translation. In the following article this stood out for me. Suffice it to say that Wayne and those who are believers in (essentially) literal translations fail to realize that although “every word” in the Scriptures is inspired, these individual words are found in context. We find meaning in the words when we look at the context. We know what the words “it”, “is”, “up”, “to”, and “you” normally means, but what they normally mean is light years away from what they mean in the context of “it is up to you.” We know what “dog” and “cat” normally means. But again the animal component of “dog” and “cat” is lost with the expression, “It’s raining cats and dogs”. Wayne and those who push essential literal translations fail to understand the basic principles of translating accurately. One needs to translate the words according to their context. Wayne argues from verses such as Matt. 4:4 that “the expression ‘every word’ coupled with the fact that the words proceed from the ‘mouth of God’ places further emphasis on the very words themselves.” If that is the case then David did not die, because the Hebrew word reads “sleeps”, and David is indeed side by side with his fathers, and David has more than one father (maybe referring to his fathers-in-law). Wayne fails to recognize that the words coming out from the mouth of God are found in context. They are not in isolation. I find it strange that my professor for advanced Greek Exegesis, who taught the importance of interpreting Scripture by looking at the context, would suggest that there is some intrinsic value to these words in isolation. And if there is so much value in the individual words, then why does one find so many words in the Greek and Hebrew that were not translated by Wayne and company? Why compromise translating literally with “essentially” literal? They realize that it would not make any sense to the reader if they translated literally. However they fail to realize that the reader is also to a great degree either confused or mislead as well by an “essentially” literal translation. They fear that the more dynamic equivalent type translations distort the Word of God, not realizing that it is these “essentially” literal translations that produce the cults and sects. The Mormons and Jehovah’s Witnesses and other cults and sects do not read the dynamic equivalent translations. They prefer the “essentially” literal ones. I like what Kermit says and I can appreciate it having studied several foreign languages in my lifetime. There are many times you can not do a literal translation as it doesn’t make sense and it backfires. I learned this with French. This is one of the reasons why education is so valuable and needed, as it broadens your horizons. So already we have some translations issues but I think we should all pause and reflect on Wayne’s un-orthodox view of the trinity and ask if his un-orthodox views of the Trinity affected the ESV. There is a reason why I started out talking about how Joseph Smith rejected the Trinity. Many questionable organizations and movements have rejected or tinkered with the Trinity. The Book of Ecclesiastes teaches us that there is nothing new under the sun, and no where do we find that more true than with Eternal Subordination of the Son. Many parts of Neo-Calvinism are fads, flashy and highly questionable. It bothers me that I can’t go to some churches which I would prefer because of how they have been theologically hijacked, adversely affected and troubled by these issues. People should care for a number of reasons, let me explain the reasons why. One is for how it treats and redefines women. It almost makes me want to ask the question, when people go to incredible lengths to redefine core doctrine which flirts with heresy what is the end goal with females? Are women human and is it an over reaction to feminism? What part of feminism is this a reaction to? Is it something like abortion rights or the demand of equal rights and equal pay? I am just throwing this out for your consideration. But here is the other thing that is most troubling. The Trinity has been the foundation for most of orthodox Christianity for centuries. From the Neo-Calvinist crowd you hear the phrase, “sound doctrine” and then you learn that their “sound doctrine” is not so sound after all. There are many reasons why I reject the ESV translation of the Bible. I could go through a large number of reasons and perhaps will do so in another post. In this case I wanted to write this post in light of my past Mormon background, and what I almost became when I was in college. I felt qualified to take on this topic because I pushed back from an organization that tampered with and rejected the Trinity. But there is another reason why I write this post. At this blog I am tackling issues within the Evangelical Free denomination. I am working through all 17 districts and calculating the rate of growth Neo-Calvinist theology in the Evangelical Free. The ESV Bible is popping up in many parts of the Evangelical Free Church. I would like to focus on the Church at Charlotte, which is an Evangelical Free in Charlotte, North Carolina. In June 2014 this church dumped the NIV and replaced it with the ESV. The Senior Pastors explained the reasons why they were embracing the ESV in this blog post here. Now since the ESV brings a shady past, and a Calvinist agenda to it, plus if Arianism has influenced this translation what are the Senior Pastors of Church at Charlotte exposing their congregation to? What has Jim Kallam and Dave Huber done in the end? The Pastor is supposed to take care of the flock, and protect it from problems, and issues. In this case has that happened? Or has Jim Kallam and Dave Huber promoted a questionable translation and thus adversely affecting the spiritual health of their congregation? Does Jim Kallam and Dave Huber have the discernment needed to do their job? This is a disturbing and heavy topic, I know. But let’s be open and honest, things get in under the radar, and people advocating for questionable or un-ethical theology can be shady. There are many other Evangelical Free and other churches doing the same thing, and in light of the greatly disturbing position of Wayne Grudem’s view on the Trinity, it needs to be addressed and tackled. For me Wayne Grudem has been a questionable and shady character in many ways. He took money from a highly questionable ministry – Sovereign Grace – to finish the translation of the ESV. He did this and when it was later learned that people in Sovereign Grace were facing church discipline and asked to “give until it hurts” and forsake meat, and eat oatmeal for dinner. (Yes this in the third world country of the United States of America) Despite that Wayne Grudem didn’t do a damn thing when all this information became public. Its like what I wrote about the other day, in the Neo-Calvinist crowd money trumps doctrine. But it begs another question…since the ESV came off the backs of those in SGM who faced spiritual abuse and ate oatmeal for dinner, should churches like Church at Charlotte who promote the ESV repent to those in the D.C. area who suffered in Sovereign Grace? Or in other words is the Church at Charlotte in sin for using the ESV which was created in questionable circumstances? God help us if the church has a collective soul and cares for what is happening one state away right? Maybe at the very least the Church at Charlotte Pastors Jim Kallam and Dave Huber can open up their food pantries to those who gave up meat in SGM? Better yet maybe they can take some of these families to the butcher and buy them some meat. But here is another thing that troubles me. ESS teaches subordination roles even throughout eternity. When I watch this doctrine creep and grow in the Southern Baptist Convention or the Evangelical Free Church of America it begs the following question from me. Why did I push back from Mormonism? I pushed back and rejected Mormonism because it was another Gospel. Now I am seeing the Neo-Calvinist movement almost embrace a Mormon like theology system. The obsession with gender roles in heaven, reminds me of what the Mormon church teaches about heaven. Its troubling but as I sit back and watch this all happen and I reflect on my Mormon past and ask why I am seeing this disturbing theology grow? Not only that…but did Wayne Grudem teach this when he was at Trinity Evangelical Divinity school? If so does doctrine deeply matter to the Evangelical Free Church of America? Is the Evangelical Free committed to the Nicene Creed? But there is another concern as well. Look at historic movements, and events they are often driven by a book, manifesto or document. For example Karl Marx and Frederic Engels penned the most famous manifesto in history which was known as the Communist Manifesto. It became an inspiration for tyranny and oppression and communism and was adopted by the Soviet Union and Eastern Europe during the Cold War. The conflict between the eats and west became one of the defining issues of the 20th century. Upton Sinclair in the United States published The Jungle. That book which described sanitary issues in Chicago’s meat packing industry became a catalyst reforming that industry. In China, Mao’s “Little Red Book” became a driving force in the Cultural Revolution. That is how I would suggest the ESV be looked at…it’s a version of the Bible heavily created for the Neo-Calvinist movement. It is not objective instead it has an agenda. After all if you can translate or control the Bible to your flavor you have your end game. You can control the masses, or dictate the theology you so desire. The Bible should not have any agenda behind it. The only goal of the Bible should be to broadcast the message of the Lord. When it is tainted, or stained by controversy then you have some serious concerns that create needless stumbling blocks for the church. Hopefully by now you should be asking the question in your mind, if Wayne Grudem holds an un-orthodox view of the Trinity that is similar to Arianism, it begs the question. Should he be teaching? Should he be publishing? Should he be employed by a seminary? When I hear disturbing stories coming out of Wheaton, or consider what Westminster Theological Seminary did to Peter Enns, it begs the question. Better yet consider how Wayne Grudem called for Peter Enns to be let go for un-Biblical theology. Why hasn’t Phoenix Seminary taken any action and let Wayne Grudem go for his heretical view of the Trinity? Or here is another question….did Wayne Grudem teach against the Nicene Creed when he was employed at Trinity Evangelical Divinity school? Or does the Phoenix Seminary also embrace a Semi-Arian view of the Trinity? Its my hope by now that you will have more concerns about the ESV translation. With Wayne Grudem overseeing the translation of the Bible, and his un-orthodox view on the trinity it makes this translation highly questionable and flawed. Up above I led the post with a video that shows how much of the Neo-Calvinist movement is a personality cult. When you have Neo-Calvinists creating celebrity pastors as idols and worshipping them as God it should cause great concern in the church. For many in the Neo-Calvinist movement their sheer devotion of the ESV and individuals like Wayne Grudem inspires this closing video. I expect to find some Neo-Calvinists some day clinging to the ESV even in their death. They can’t let go of the fact that someone like John Piper autographed it. How can they live without Pastor John, or that other celebrity pastor behind it? Somehow the church survived 2,000 years…damn it if we got it wrong for that amount of time! 😛 This was a difficult post to write, I invite pushback and your thoughts on Wayne Grudem, ESS and the ESV. As I spoke about the Church at Charlotte I want to go on the record of stating that this has been emailed to the Pastors and staff of that church, as well as EFCA Southeast led by Glen Schrieber. With that I will read some of my NLT. As always I love you guys! C.J. Mahaney, Complementarianism, Council of Biblical Manhood and Womanhood, Culture Wars, ESV Bible, Evangelical Free Church of America - Southeast District, Evangelical Issues, Mormonism, My East Coast Mom, Neo-Calvinism, SGM, Sovereign Grace Churches, Wayne Grudem, What is a Man? 1. Wayne Grudem’s links to the SGM scandal. 2. My Mormon experience and seeing how they denied the Trinity. 3. Watching the Neo-Cals developing a “Mormon like” theology system. 4. Churches like Church at Charlotte adopting the ESV which I believe is bad policy. 5. Watching the Neo-Cals operate more and more like the Mormon church in their dishonesty. 6. Watching the Nicene Creed by played with. David, excellent post. Gosh….dude…how in this world are you ever going to have a personal life if you spend this time in such exhaustive research and commentary? Hats go off. ESV. Ok…as we once discussed face to face. I personally use the ESV. Would I replace it now? Check prices on Bibles. Yikes…for one…the pricing is alone a hurdle. But I do enjoy reading scripture and have found nothing that hinders me so alas, will stick with it. But I get your thought process and appreciate your overview. I had heard for the last several years that NT Wright was heretical and taught Universalism and am almost finished with his critique of Romans and his teaching on Paul. I get what he is teaching because they address so many of the questions that the Evangelical church avoids. (NT is Anglican). NT addresses Cain. The Jews. The Torah. And what about that 1000 year reign in Revelation when a large swath of “saved” believers turn their back. Or circumcision? The whys that challenge our thinking and yet we are suppose to just say “Jesus paid it all”. Well….it is not as simple as that. And the mystery of the Trinity is another dogma that can hit back at the how. But off topic here…NT makes it clear there are big issues with the NIV translation, and for NT whom has studied Greek for over 40 years, he makes a good case and in my lifetime, before ESV,,,I had always heard the NIV was the best text to use. NT refers one to the Revised American Standard. Fascinating how we now have so many versions that can be questioned on some key questions. Since I am no scholar, the ESV does allow me to read, think, and enjoy…but I get what you are saying 100%. Prodinov…social life? What social life? 😛 I use the NLT personally The NIV isn’t perfect, but what troubles me is how the ESV is rolled out and talked about as “the scripture to use” and it has serious flaws. Plus its also the creation of the Reformed Industrial Complex as well. The machine behind such projects and books should give many people pause. Is the reason why the Neo-Calvinists support it because some profit from Crossway in the end? I don’t know I am thinking this out loud. I understand your concerns and am understanding more and more why we should be concerned. For example, the video you posted above….one part of me says it is great to have fun, enjoy being a little out of the box…then the other part says why do it to lift up a personality (Grudem). That seems to defeat the purpose of hanging, having a little social activity minus the blatant hero worship. There are still those I have listened to in the “reformed” camp in which I have gleaned some good stuff and applied in my life…and yet…as WW and you have harped on….we must be careful about how we lift up those whom are pastors. Why give them so much latitude just because they are good with their words? Their spoken abilities? This becomes the battle of how we take scripture, dwell in it…and yet try and find better understanding via teachers. Who are these teachers to be? BUT….here is my positive critique on you. I have been a little surprised at your harsh language toward certain “reformed” pastors. I truly see your passion in the connecting the dots scenario. I still remain in disagreement on some of the names you connect. YET, again, I am trying to give a benefit of the doubt to some of those whom have aligned themselves with questionable “reformed” persons of interest. Having said that, I find your comments becoming less and less aggressive and more informative/more insightful/more studious which makes reading you so much better in terms of seeing how your comments fit into my view of church, leadership, scriptural references, etc. I connect with you so much better when I hear less anger coming from you. (Anger is justified, but I am commenting on how I read postings). I myself prefer to hear your well documented overviews that show increasingly long hours at gathering your information than the times you make insinuations that I just do not get. (These are isolated incidents and in no way are saying you are wrong…just how I myself view it as an outsider). This is your blog. Your expressions. Overall….you do an excellent job at making one think, one to evaluate, one to compare, and gives one like myself pause as I like yourself continue on this journey of faith. Thanks for all your hard work. Prodinov sorry I am late at responding. I am a one man show who is busy, overworked and on the run. What drives me in this blog is the pain from that incident in a former Sovereign Grace church. There is something terribly wrong when people espousing their faith can’t practice the basics. I work hard at this Prodinoc because I don’t want people to get hurt. I have had people approach me behind the scenes and tell me they were thinking of a church, and then they read my post and decided to stay away. That gives me comfort in sparing someone from something painful and harmful. You know I want to give everyone the benefit of the doubt. I honestly want to be found wrong. I would love to have Redeemer Arlington prove me wrong and show me they are different than the culture at CLC of Sovereign Grace Fairfax. I would be thrilled if Fairfax Community Church actually repented and did the right thing. I would support, embrace and wouldn’t mind attending a couple of these places. Bottom line is that I want to be a man open to learning, growing, and flexible. And when I am wrong I want to admit it. Own it, for myself and those in my midst. I hope that helps you. Sorry it took a day to respond. Your best post yet, Eagle. Thanks Shy I appreciate your kind words. The name isn’t Wayne Grudem, it’s WAYNE GRUDEM GO WAYNE GRUDEM! with the musical accompaniment of smacking lips against Gluetus Maximus Grudemus. The Trinity has been the foundation for most of orthodox Christianity for centuries. From the Neo-Calvinist crowd you hear the phrase, “sound doctrine” and then you learn that their “sound doctrine” is not so sound after all. Sound Doctrine(TM) = The Party Line. Pure Ideology, Pure INGSOC. As you say HUG…purity of ideology comrade, purity of ideology. I think you have to judge the ESV purely on its merits. Great care is taken in modern revisions to try to avoid denominational or doctrinal distinctives of the various translators finding their way into the text. The ESV is a revision of the Revised Standard Version, which in its time was rejected by many conservative evangelicals for being too liberal! The new revision retains the wording of the older one for the majority of the text, clarifying or improving in places and updating obsolescent vocabulary in others (‘thou’ finally disappears). If a doctrinal bias has crept in, you would need to show this and compare the new version with its predecessor. I don’t think anyone has done this to date. I also think the ESV has made a good faith attempt at reproducing the gender nuances of the original, as language use has changed in recent times. It notes when ‘brothers’ (RSV brethren) could refer to ‘brothers or sisters’. It avoids gender-neutral language where this is not used in the source Greek texts, a standard practice amongst translators. TNIV was rightly criticised for not following this procedure. I still use the RSV, partly because of the print size. Wait 30 years and you will understand … It also pre-dates some of the gender disputes, and cannot be accused of fiddling the translation to suit someone’s agenda in this regard. But it does have its weaknesses. Ken on this issue we are going to have to disagree. I think the ESS is being used by some to justify complementarism and take it to the next level. There are some intrinsic issues with this approach, the biggest is that its challenging orthodox theology of the trinity. That is why I wrote this post in many ways. I find it deeply rich that Wayne Grudem wanted to see Peter Enns fired for not be true to scripture, and yet Enns the last I heard had an orthodox view of the Trinity. When is Phoenix Seminary going to do the same thing? This isn’t scientific, but I’ve read the usual complementarian texts in context in many versions, and the RSV and the ESV in particular do not substantially differ. In fact in most cases are virtually verbatim the same. The only passage with notable differences is 1 Cor 11, where the ESV is a considerable improvement on its predecessor in using covering instead of veil. Ken I think complementarianism differs on meaning. Its just that with the Neo-Cals they have gone off the deep end. End it varies…note that Carolyn McCully at Redeemer Arlington I would suggest has largely been exempt form it. It applies to the peons in the pews. And it’s not just Joseph Smith. Ever heard of Charles Taze Russell? He’s the guy who started the Jehovah’s Witnesses. To the JWs, Christ was originally the (created) archangel Michael; their official Bible has been “creatively edited” to reflect this. And all that was just from a skim of the Wikipedia page; I’m sure there’s more detailed sources out there. So versions of the Bible is still a big thing for Christians then? Are KJV only people still out there? Blue…amazingly the KJV people still circulate…I was in China (my wife immigrated) teaching English and in this particular locale, the Americans doing the proselytizing were all KJV people only…quite interested to see how they were infiltrating other countries and using legalism to insert their ministry as the only one….so yes…I think you may have been asking that question with the answer already known, but I had to add my observation…. I’ve been way out of the Christian mainstream for years Prodinov, so I actually didn’t know if KJV was still a thing in any mainstream sort of way. I thought it was more a thing like flat earthers. Well at least it’s a really pretty piece of literature in a lot of ways, the KJV that is. FYI, FWIW, the EFCA Eastern District Superintendent Dr. C. Eddie Cole advocated for & recommended the ESV during his 12 years (2003-2015) as pastor of Salem EFC on Staten Island to the parishioners many times during worship services/sermons. The ESV is the bible version used in the pews there. Perhaps you may wish to email this missive to him & ask him about the reason(s) for his views on this translation. He seemed to be quite convinced & seemingly had a lot of biblical scholarship to back up his views. Perhaps an interesting & illuminating conversation may ensue. Wayne Grudem being worshipped? Chuckle. Clearly those people admired Grudem, but they weren’t above taking the mickey either. Not often you hear people laughing at a “worship song”. Pretty clever. Reminded me of a camp talent show. So, I’m way late to this party (just catching up on your blogging, Eagle). A couple of caveats: 1) I typically can’t stand Wayne Grudem, 2) I agree that the ESV is deeply problematic, 3) I find the word choice of “Eternal Submission of the Son” to be rather unfortunate, because as you rightly point out, it sounds like Arianism. That having been said, I think that Grudem’s trinitarian position is (more or less) correct, and he has the overwhelming weight of early Christianity on his side. Back East, we call it the “monarchy of the Father.” I can’t stand the way he extrapolates that position into societal issues such as gender role, but… I can’t say he’s essentially incorrect. The blurring of the roles of the divine Persons of the Trinity came about after the introduction of the Filioque in the West. Eh, to a certain extent I agree with regards to different views, different terminology, etc. But as best I can tell, a lot of evangelical folks going after Grudem are doing so in the name of Nicene theology, and if Nicaea is our common starting point then I think we’ve got the same parameters for discussing this. Now, let me make my caveats again: Grudem is a blowhard, his word choice is incredibly bad, and trying to extrapolate from the Trinity to gender roles is goofy. Let me also hastily add that as I’ve explored other things that Grudem says about the Trinity in the days since I made the first comment, I’ve found other deeply disturbing views that he needs to be called a heretic for. But, the basic idea–that is, that the Persons of the Trinity have distinct roles from all eternity, etc. is correct. Denying this would seem to lead straight into modalism, which is also a heresy that’s been roundly condemned by all Christians for many centuries.